More travel hacks for the travel-junkies out there! 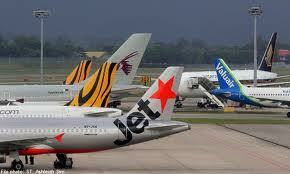 Specifically, for budget flights out of Singapore - we're talking about Jetstar, Air Asia and Tiger Airways. Who doesn't love a weekend get-away, or a short trip that makes use of the wonderful Singapore "long weekend" benefits when public holidays lie just before or after a weekend? I know Singapore is a pretty awesome city with loads of stuff going on, but if you haven't, I highly recommend that you jump on a budget flight to explore this amazing region of Southeast Asia. Today, budget flight tickets to the region are mostly available online and they've made it so easy for consumers to purchase tickets. A mini #lifehacksg here - don't forget to sign up for things like Jetstar's Jetmail where they send you regular updates for their Friday Fare Frenzy deals; I've personally gotten some ridiculously low ticket prices which can only be achieved otherwise via a.... paddle-boat of sorts. Navigating a budget airline's checkout process is tricky, mostly because of their add-on features. While the ticket may be cheap, budget airlines make a ton of margin off features like extra baggage, food, insurance etc. To increase their chances of having you pay more, these options are often a "opt-out" feature; that is, you literally have to check NO such that they don't charge you for these extras. I say, go for the barebones package. Towards the end of the checkout process, most airlines slap on this thing called a "convenience/processing fee", which is presumably used to cover the administrative costs of processing the transaction with the credit card companies. Fair enough, but at close to 5-10% of a ticket cost, that seems way more than what the credit card transaction fee will cost. Anyway, this is unnecessary money that should be stripped away. With the offline payment function, what you're effectively doing is making a reservation at NO COST, with a 48 hour period to make a call on your buy-option. So while you're price searching, go ahead and secure a Jetstar price (through the "reservation") while you continue to figure out the best deals. What one could use it for is also to secure tickets for a group of people, and then go seek their consensus on whether the trip should happen. I've personally used it a few times and it's just great! Alright, another travel tip to the bucket of lifehacks in Singapore!